Caroline went to her first pumpkin patch ever. I’m not a huge fan or opponent of Halloween. I think it’s an average holiday and take it as an opportunity to meet neighbors I never would have otherwise. Generally we sit on our driveway and talk with people when it’s light out and then retreat into our house once it gets dark. It gives us an opportunity to interact with people as they walk by and talk with other young families in our neighborhood, mostly because they are the ones who are out before dark. Part of any good Halloween is having a pumpkin. Not a fake pumpkin, although we have one of those too, but going to an artificial pumpkin patch in a church parking lot and picking out a pumpkin. We have two options in our neck of the woods a gigantic one with a carnival next to it or a small patch with only pumpkins. We opted for the smaller one for Caroline’s first so we could get some good pictures without making her crazy with all the noise. 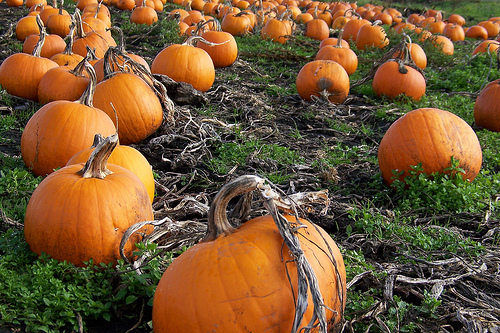 After the pumpkin patch, we loaded up and headed off to the nearest Trader Joe’s…which was 35 minutes away. We have never shopped for groceries at one and had heard the magical claims of the Trader Joe’s faithful. We bought so much stuff while we were there. We bought stuff for lunches for this week, bottles of wine (which we don’t drink often), things that looked new and interesting, all kinds of stuff. When we got to the register I was a little worried about what number might be waiting for us, but it was about the price of an average week at the grocery store for us. We got home and tried some of our newly purchased food and it was all excellent. I don’t know if we’ll head there too often (because of the commute), but it’s good to know that it lives up to the hype if one decides to sprout up closer to us.